Is today a NGD? It Suhr is! .....sorry for the dad joke. Anyway, I tried a Suhr for the first time a few weeks ago, and the experience pretty much ruined my life. Needless to say, after a few weeks of torment...here's my new Classic Pro S.
Really digging it a lot. I have a bunch of 'metal' guitars, but needed a good S style guitar in the arsenal. This more than does the trick. I love the SSV bridge pickup, and while the V70's sound great, I sort of fell in love with the ML's that were in the Classic Antique that I tried. I just didn't want the nitro. I may swap them out later on down the road. We'll see. Anyway, here are some pictures with it and my other adult guitar...which I'm about to drop a Suhr Aldrich set into. Re: Is today a NGD? It Suhr is! Metal is good... but sometimes it's nice to back off the throttle. Gorgeous guitar. I've never tried a Suhr that wasn't fantastic. Thanks guys. The hardest part of buying one of these....is deciding which Suhr you'll get next. Suhr used to use the ilitch system, but have since come up with their own proprietary noiseless system. I haven't tried the Ilitch system, but the Suhr system is incredible. The singlecoils are dead quiet. They're multiplying. The gold JM Pro just showed up. Lovely pair you have there! My only current Suhr exposure is their pickups. Threw some in my CE-24 and love them so far. Just can't seem to find any locally when the timing is right. You're freaking me out with that gold one. First pic shows three knobs, next pic shows two. Either way, that is a gorgeous guitar. Suhr junky here as well. I started off about three or four years ago with my first classic antique. Loved it so much, I had an identical (except different color) one made. 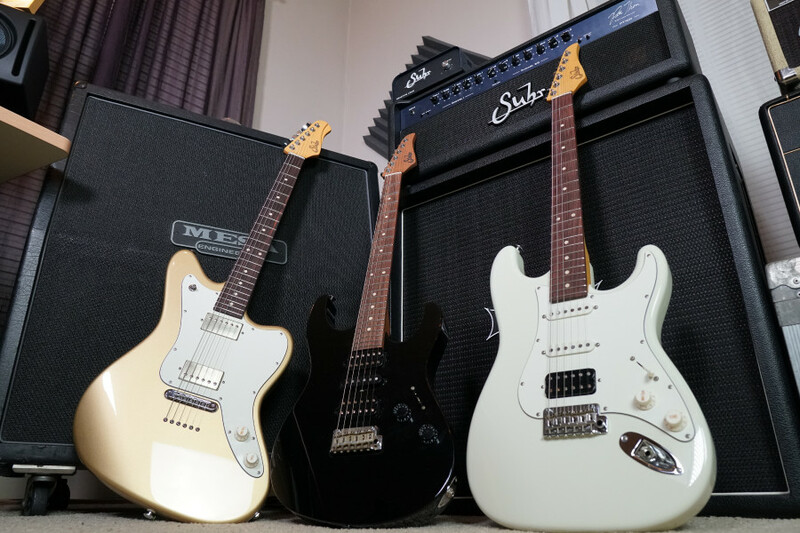 Suhr had changed the classic antique the year after I bought mine, and I wanted a 2nd one that was the same. Several months ago I picked up a used (though might as well have been new) Alt T pro. Fantastic guitar. One thing that has me hooked on these guitars, aside from the fantastic tone and playability of course, is the stainless frets. I got so tired of needing fret jobs every 3 or 4 yrs on my nickle fret guitars. My Suhrs show no sign of fret wear what-so-ever. For sure. It's kind of hard going back to playing anything else once you get your hands on these things. 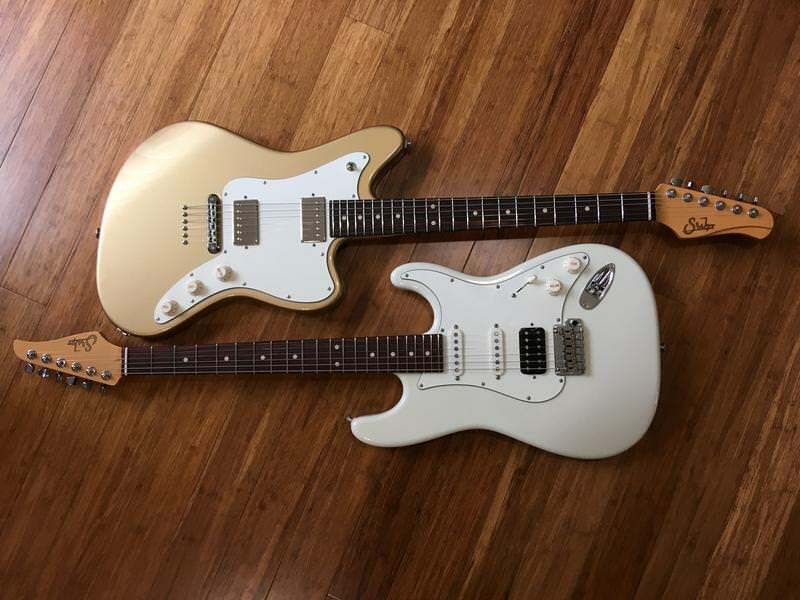 The gold JM shipped with a volume/tone/tone routed pickguard, but I had a custom guard made at Suhr with a master volume and tone in the traditional tone 1 and tone 2 positions to get the volume knob out of the way a little. It's also loaded with raw nickel Suhr Aldrich pickups instead of SSV's. It's a super cool guitar, but it's actually for sale. The JM body style just isn't for me. A Classic T will replace it.